ChmHelp Authoring Suite (Word-2-CHM) 2012 is a perfect Word doc/docx converter for making Unicode CHM. ChmHelp Authoring Suite can converting Word to compiled Unicode HTML help and create modern help system from doc or docx for almost seconds. No worry about how to make Unicode HTML help anymore! Creating compiled Unicode HTML help from Word doc/docx as easy as Word processing now! Key Features: Full-text search; Flash/multi-media supported; Template based and full customizable; Batch command line. You could build your compiled Unicode HTML help from doc for almost seconds with ChmHelp Authoring Suite 2012. 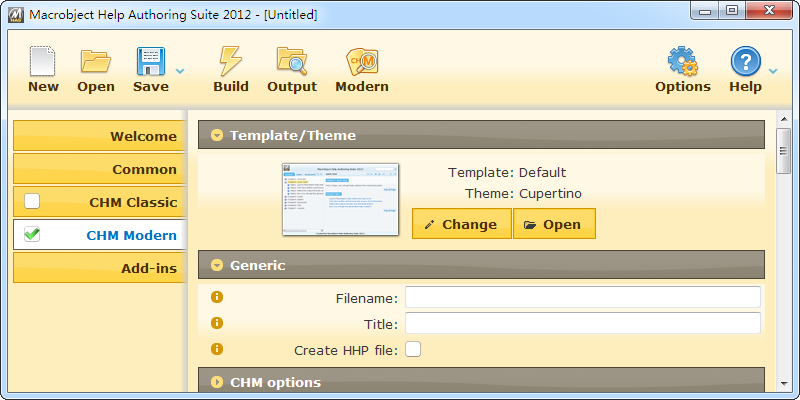 You could also save your conversion work as a project for re-use with ChmHelp Authoring Suite 2012. ChmHelp Authoring Suite is a really fast Unicode CHM help maker for technical communicators and policy writers and other content creators. That is the power of ChmHelp Authoring Suite. Just focus on the content! More Features: Modern CHM user interface; Unicode support; CHM help generated according to outline of Word document; Customize the automatically created Table of Contents and index; All links or anchors or bookmarks will be converted into hyperlinks; Customize your content such as header/footer or navigator or related topics; Supports Word master and sub-documents; Context-sensitive help and HTML Help API supports; Supports Word HTML cleanup; Customizable themes for CHM files and window style of CHM viewer.